France boasts a vast wealth of waterway delights but few are as celebrated as the Canal du Midi, an engineering marvel that flows through a landscape studded with historical gems. Canal des Deux Mers is the modern name for the entire navigable route of over 300 miles linking the Atlantic Ocean with the Mediterranean, of which the Canal du Midi is a integral part. While the Canal de Garonne flows from the city of Toulouse to Castets and then onto Bordeaux as a tidal river, the Midi runs from the Toulouse down to the Mediterranean port of Sète. 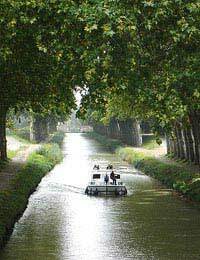 The Canal du Midi officially opened to navigation on May 24, 1681 as the Canal Royal de Languedoc. Constructed over fifteen years under the supervision of one man, a wealthy tax collector called Pierre-Paul Riquet, its original purpose was to be a short-cut between the Atlantic and the Med. In cutting through south-west France it would allow travellers to avoid the long and arduous sea voyage around the hostile Iberian Peninsula, a route fraught with pirate attacks. When it was constructed the canal was considered to be one of the most remarkable and innovative engineering projects of the day and its wealth of historic construction achievements are still highly prized today. This status led to it being added to UNESCO’s prestigious list of World Heritage Sites in 1996. Its length is studded with a dazzling array of engineering feats. In addition to many locks, each a small historic wonder of innovation that apart from their electrification have remained largely unaltered in centuries, its 328 structures included 8 aqueducts, dams and even a tunnel. Riquet was far from the first to put forward such an ambitious project but the key dilemma the earlier proposals had failed to resolve was how the water would be supplied for such a canal. Through extensive surveys Riquet found his solution in the construction of a series of dams and lakes from which he could channel water from the River Laudot, and then later from other rivers in the area, using a diversionary channel known as the 'Rigole de la Montagne'. This led to the building of the Bassin de Saint-Ferréol, the first artificial reservoir for feeding a canal. With its giant 700 metre long dam - only the second major dam in Europe at that point - the construction was credited as being the single greatest work of civil engineering undertaken during the Canal du Midi project. This was not the only first for the Midi. Its 173-metre long Malpas Tunnel at Enserune became the first canal tunnel in existence. One other major landmark along the route is the remarkable staircase lock at Fonseranes near Béziers, which comprises of 9 locks cut out of solid rock that originally helped take canal traffic up or down a steep incline of almost 22 metres. Its historic status is certainly a draw for the huge number of visitors from across the world that the canal now attracts - accounting a fifth of all river tourism in France – but they are also entranced by the sheer delight of the route itself and its surroundings. Although used for over three centuries to aid the passage of various cargo, such as wine, industrial goods and farm produce, the canal’s function is now entirely devoted to leisure and pleasure. However it still has a crucial role to play in the development of the local economy albeit now in delivering visitors to the localities of the corridor 'rivières et Canaux du Midi' rather than goods. Visiting boaters can now lazily cruise along under the flickering green arches of trees, alongside swathes of vineyards, taking time out every now and again to drink at a canal side café, roam the local markets and to explore the various historic sites on route. These include the Roman town of Narbonne and its Merchant’s Bridge, the Cathar castle at Argens-Minervois, the 12th century castle at Capestang, the 10th century church at Villeneuve-les-Béziers and famous medieval walled city of Carcassonne. This is also a canal where there is no need to worry about navigating, as there are only really two routes – upstream or down.